Blonde Warrior's trainer, Hugo Palmer. Blonde Warrior can get his 2019 campaign off to a perfect start in the Dubai Duty Free Full Of Surprises Handicap at Newbury. Hugo Palmer’s charge was talked of as a potential Classic contender after winning two of his first three juvenile outings last year, posting comfortable victories at Yarmouth and Doncaster before making the leap to Group Two company at Goodwood. The Zoffany colt found that assignment beyond him, though, coming home a well-beaten eighth in what appeared to be a sound renewal of the Vintage Stakes. Given a break following that disappointment, Blonde Warrior only just failed to sign off with a win on the all-weather last September – beaten a neck by Fox Coach in a conditions event. He was conceding weight all round that day, so Blonde Warrior deserves plenty of credit and shapes as though he will improve further for another step up in trip this year. Blue De Vega has fallen to his lowest-ever mark, and it could be dangerous to rule him out of the Dubai Duty Free Handicap. Third in the Irish 2000 Guineas three years ago, Blue De Vega has been plying his trade as a sprinter since joining Robert Cowell at the end of 2017. While he has triumphed only once in 18 starts for his current trainer, Blue De Vega has shown flashes of ability and was not disgraced when beaten only four lengths in 10th in a highly competitive Catterick heat at the end of last year. Rated as high as 110 in his pomp, Blue De Vega is now on a perch of 91 and has a couple of bits of form in the book which suggest he could come good when everything falls right. Headman is the pick in the Dubai Duty Free Golf World Cup British EBF Conditions Stakes after two fine all-weather efforts at the back-end of last year. Hailing from the family of Flintshire, this Kingman colt was sent off odds on to make a winning debut at Newcastle – and he obliged in style, cruising home in a novice event once the penny had dropped. He had to settle for second next time behind Classic hope Zakouski – but as he was giving him 7lb and was only beaten two lengths, it certainly was not a bad effort. Roger Charlton pitches him in over 10 furlongs here, but there is every reason to think that should be well within his compass. Festival Of Ages has been acquitting himself well on the all-weather and can make a smooth transition to turf in the Compton Beauchamp Estates Ltd Silver Bar Handicap. Beaten in two Fast Track Qualifiers on his two most recent starts, Charlie Appleby’s runner will not lack for fitness and has shown ability in two previous turf outings. Probability can bring up her hat trick in the 32Red.com Handicap at Kempton. The three-year-old is on a roll now, winning three of her last four starts for Archie Watson – with front-running tactics really bringing out the best in her. Directory took a bit of time to find his groove for James Fanshawe – but after getting his head in front a couple of times last year, he could make a victorious return in the 32Red Handicap. Previously trained in France, he did not strike gold until his sixth outing in Britain, but then became a model of consistency, and may pick up again where he left off. Tommy Silver can take a starring role on the first day of the Scottish National meeting at Ayr. He lines up in the Hillhouse Quarry Handicap Chase on the back of a recent Ludlow success and should thrive on the likely good ground. His fellow Paul Nicholls inmate Romain De Senam can also claim a slice of glory for the Ditcheat team in Fontwell’s Neil Madgwick Memorial Sponsored By Family&Friends Handicap Chase. 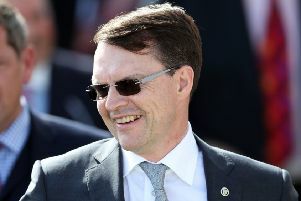 AYR: 1.50 Getaway Trump, 2.20 Fairway Freddy, 2.55 Sam’s Adventure, 3.25 Tommy Silver (treble), 4.00 Niven, 4.30 Yeats Baby, 5.05 From Eden. FONTWELL: 2.10 Et Moi Alors, 2.45 Captain Cattistock, 3.15 Danse Idol, 3.50 Romain De Senam, 4.20 Jimmy, 4.55 Finnegan’s Garden, 5.30 Mount Windsor. KEMPTON: 4.35 Hooflepuff, 5.10 Cauthen, 5.40 Directory, 6.15 Hey Ho Let’s Go, 6.45 Probability, 7.15 Sapa Inca, 7.45 My Girl Maisie, 8.15 Rock In Society. NEWBURY: 2.00 Album, 2.35 Blue De Vega (next best), 3.05 Festival Of Ages, 3.40 BLONDE WARRIOR (NAP), 4.10 Headman, 4.45 Samstar, 5.20 Scenesetter, 5.50 Alnaseem.